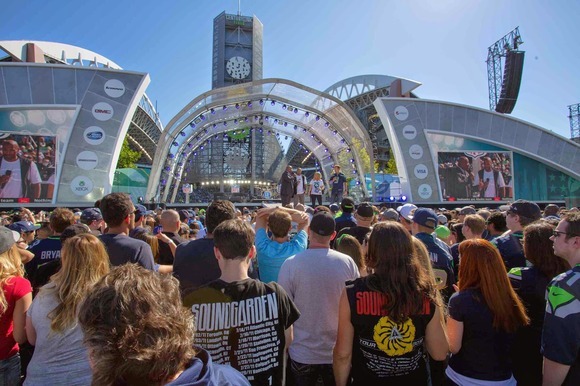 SEATTLE, Washington – Featuring free performances by Pharrell Williams and Soundgarden, the 2014 NFL Kickoff Event scored big with sonic capabilities provided by New York-based Firehouse Productions. Held outside Seattle’s iconic CenturyLink Field, the annual event’s musical guests were backed by an audio system featuring HARMAN’s JBL VTX line arrays and Crown I-Tech HD Amplifiers. Having designed and managed sound reinforcement systems for various major rock tours and high-profile live broadcasts, Firehouse Productions was well equipped to handle the event. “This was a good, straightforward show for us because we knew we were only going to be dealing with just two performers,” said Mark Dittmar, VP of Design and Engineering, Firehouse Productions. Taking place just outside the CenturyLink Field stadium, Dittmar and his team were challenged with city restrictions on decibel levels, as well as the customary Seattle rain. To stay within the city’s stringent limitations on sound levels, the team relied on JBL VTX line arrays as well as several delay towers with JBL VERTEC® loudspeakers to manage the sound coverage within the outdoor space. The stage’s main hang featured 14 JBL VTX V25 line array elements while 12 VERTEC VT4889 loudspeakers were deployed for side hangs on either side of the stage. Firehouse also utilized two clusters of six VT4889 for rear-fill and 12 VT4889 loudspeakers for the delay towers. The system also consisted of 16 VTX G28 and 20 VT4880A subwoofers and was powered by 90 Crown I-Tech 12000HD amplifiers. In addition, the system was monitored and controlled with JBL’s HiQnet Performance Manager™ software. For more information on Firehouse Productions, please visit: www.firehouseproductions.com.